Wil is one of the province’s top ice fishing sticks. He was a member of Canada’s National Team at the World Ice Fishing Championships in 1991. He taught ice fishing courses at various campuses of Seneca and Georgina College from 1986 to 2006. Since then he has provided seminars on the subject to packed houses across Ontario. Wil’s home lake is Simcoe, one hour north of Toronto and he has extensive knowledge of this, the most intensively fished inland lake in Ontario. He has appeared several times on Bob Izumi’s Real Fishing Show- ice fishing for everything from big lake trout on Lake of the Woods to jumbo yellow perch from Lake Simcoe. Wil has several top ten finishes in the Canadian Ice Fishing Championship and won the 2006 Perch Attack on Simcoe. In March of 2011, Wil and his son Izaak placed 1st in the Perchin For MS Tournament on Lake Simcoe that saw over 75 teams compete and was 3rd a year later with twice as many participants. Wil is an award winning outdoor writer with many ice fishing articles have been published in such magazines as: Ontario Out of Doors, Outdoor Canada, Real Fishing, Big Jim’s Just Fishing and In Fisherman. He’s the fishing columnist for Lake Simcoe Living Magazine and is sponsored by HT Enterprises, Rapala, and Lowrance electronics. 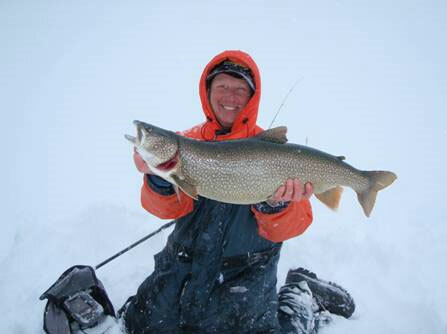 Wegman’s power point presentation will focus on ice fishing tactics to catch several species in Lake Simcoe through. Participants will learn the winter habits and habitat of species like lake trout, whitefish, yellow perch and northern pike ... and how to use a variety of techniques to catch them. Anglers will also hear how lakes like Simcoe and many others are changing because of invasive species and what they can do to adapt to those changes to still be successful on the hardwater. With a greater knowledge of the fish themselves and the tips and tricks revealed on how to catch those fish … ice anglers of all ages and skill levels are sure to find the seminar both entertaining and rewarding. “We know there a lot of passionate and skilled ice anglers who visit the Spring Fishing Show and we’re really looking forward to presenting our ice fishing talks to them”. Be sure to catch Wil’s Ice fishing seminar at 12:45 this Saturday at the Spring Fishing and Boat Show. An assortment of draw prizes will be awarded thanks to generous sponsor support.